Topics: Mission Statement, Telecom Services, Telecom Audits, Telecom Voice & Data Svc, Internet Services, and Voip Services. Godaddy.com Inc (Arizona, Scottsdale) is the location of the Apache server. There are 2 Nameservers, ns44.domaincontrol.com, and ns43.domaincontrol.com. 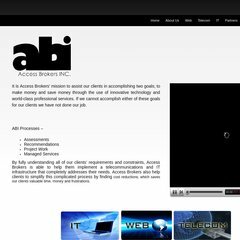 Accessbrokers.com's server IP number is 72.167.131.10. PING (72.167.131.10) 56(84) bytes of data. Pinging the server, resulted in a 66.8 ms response.